Feiwel & Friends, 9780312613426, 368pp. A 16-year-old boy who escapes a kidnapper thinks he can forget his trauma, but instead, he loses his grip on reality and believes he's part of an alternate world called Marbury. There is war in Marbury. It is a desolate and murderous place where Jack is responsible for the survival of two younger boys. Conner is there, too. But he's trying to kill them. Meanwhile, Jack is falling in love with an English girl, and afraid he's losing his mind. 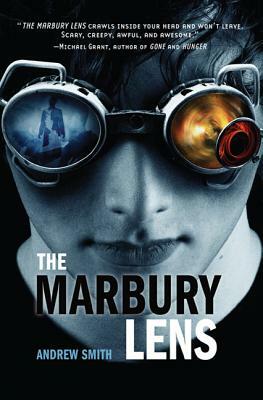 Andrew Smith is the author of Ghost Medicine and The Marbury Lens, both of which were named American Library Association Best Books for Young Adults. He is also the author of In the Path of Falling Objects. Smith started writing for newspapers and radio. He then traveled around the world and from job to job, working in metal mills, as a longshoreman, in bars and liquor stores, in security and as a musician. Now, in addition to writing, he teaches high school advanced placement classes and coaches rugby. He lives in Southern California with his family, in a rural location in the mountains.